In this tutorial, we will demonstrate how to install Phusion Passenger as your Rails-friendly web server, which is easy to install, configure, and maintain. We will integrate it into Apache on Ubuntu 14.04. By the end of this tutorial, we will have a test Rails application deployed on our Droplet. If you prefer Nginx over Apache, take a look at how to deploy a Rails app with Passenger and Nginx on Ubuntu 14.04 by following the link. The first step is to create a new Droplet. For smaller sites it is enough to use the 512 MB plan. You may want to choose the 32-bit Ubuntu image because of smaller memory consumption (64-bit programs use about 50% more memory then their 32-bit counterparts). However, if you need a bigger machine, or there is a chance that you will upgrade to more than 4 GB of RAM, you should consider the 64-bit version. Be sure to use Ubuntu 14.04. At the time of this writing, Ubuntu 14.10 does not have a Passanger APT repository yet. Moreover, Ubuntu 14.04 has an additional benefit: it's a LTS version, which stands for "long term support." LTS releases are designed to be stable platforms that we can stick with for a long time. Ubuntu guarantees LTS releases will receive security updates and other bug fixes for five years. After the Droplet is created, you should create a system user and secure the server. You can do so by following the Initial Server Setup article. If you want to follow this tutorial, you need a basic user with sudo privileges. We will use the rails user in this example. If your user has another name, make sure that you use correct paths in the next steps. In order to ensure that your site will be up and visible, you need to set up your DNS records to point your domain name towards your new server. You can find more information on setting up a hostname by following the link. However, this step is optional, since you can access your site via an IP address. We will install Ruby manually from source. Press CTRL+X to exit, type Y to save the file, and then press ENTER to confirm the file location. At this point you can deploy your own Rails application if you have one ready. If you want to deploy an existing app, you can upload your project to the server and skip to the /etc/apache2/sites-available/default step. For this tutorial, we will create a new Rails app directly on the Droplet. We will need the rails gem to create the new app. Now we can create a new app. In our example, we will use the name testapp. If you want to use another name, make sure you update the paths in the other commands and files in this section. We will skip the Bundler installation because we want to run it manually later. Basically, this file enables listening to our domain name on port 80, sets an alias for the www subdomain, sets the mail address of our server administrator, sets the root directory for the public directory of our new project, and allows access to our site. You can learn more about Apache virtual hosts by following the link. To test our setup, we want to see the Rails Welcome aboard page. However, this works only if the application is started in the development environment. Passenger starts the application in the production environment by default, so we need to change this with the RailsEnv option. If your app is ready for production you'll want to leave this setting out. If you don't want to assign your domain to this app, you can skip the ServerName and ServerAlias lines, or use your IP address. Save the file (CTRL+X, Y, ENTER). 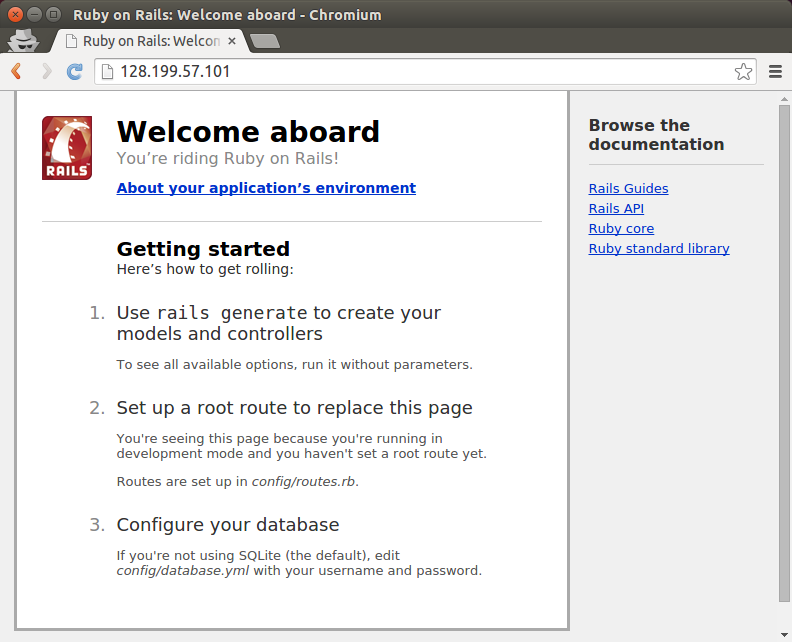 The Rails app is now live on your server. To update Ruby, you will need to compile the latest version as shown in Step 4 in this tutorial. However, if there is a new system Ruby version available, it will probably overwrite our Ruby (installed from source). For this reason, you might need to re-run the commands for removing the existing symlink to the Ruby binary file and creating a new (correct) one. They are listed at the end of Step 6 in this tutorial.